About: Côte welcomes guests from breakfast right through to dinner. The brasserie takes on a contemporary twist and offers a comprehensive menu of classic French dishes, freshly made using high-quality ingredients. 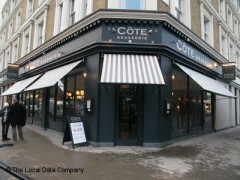 Priding themselves on exceeding the expectations of every one of their guests, Côte is a friendly and welcoming place to eat. We had excellent meat, steaks and lamb chops. Good choir of Windsor. French beer only.